Most hydroponic gardeners germinate their seeds using either a solid media such as perlite, vermiculite or coconut fibers or a woven media such as rock-wool. The first germination alternative has the problem of making transplant stress higher, while the second has the problem of being too expensive (for most hobby and commercial growers). 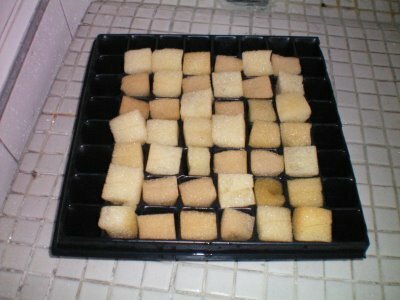 With that in mind, I intend to explain on this post how to germinate your seeds using a cheap cube of polyurethane foam which is readily wet by the nutrient solution and generates almost no transplant stress when moving the plants. The first step to germinate seeds in polyurethane foam is to buy a sheet of the adequate polyurethane. For this purpose, I use a polyurethane foam with a density of 0.015 grams per cubic centimeter. The next step is to cut the polyurethane foam in 1 inch by 1 inch by 1 inch cubes. After this is done, you have to make a cut with a sharp knife at one face of the foam cube (this is where the seed will be inserted). Once your cube is cut and ready, you have to presoak it in water. Simply squeeze the cube under water and let it absorb all the liquid it can. Once you take it outside, do not squeeze it again since this will make the cube exchange the water it just absorbed for air. Now simply deposit each seed inside a cube and place the cube in a tray for seed germination someplace where the appropriate conditions for the germination of your seeds are present. You can keep the seeds and the surface of the foam wet by misting water over the cubes everyday. Once the seeds germinate you can place them in your favorite hydroponic setup and the roots will grow out of the foam cube, into any solid media or nutrient solution. (below, an image of my germination setup ready for seed placing). where do you find this foam? and what other plugs can you use for lettuce? Thank you for this information. I've been trying to see what alternatives there are for growcubes as I've heard that rockwool has similar effects as asbestos. Using polyurethane foam seems like a very good alternative. Peace. Thank you for sharing. How does effect density of polyurethane to plant ? I am a hobbyist, and have had good success growing plants in open cell polyurethane foam. Lately, I have become concerned if any toxic substances from the foam, could be released and absorbed by the plant. Do you know if this is possible? This week I received 2 oncidium twinkles with their roots in and through foam cubes. I placed one in a bark/ sphag moss media and the other in a hydro environ. I am an experimenter at heart, but I find the grey foam in the hydro rather unsightly. I'm sure I could safely carve away some of the foam, but does anyone have a better suggestion? Of course, the safety of these little orchids is my primary concern. FYI, leaves and roots appear quite healthy in foam blocks.